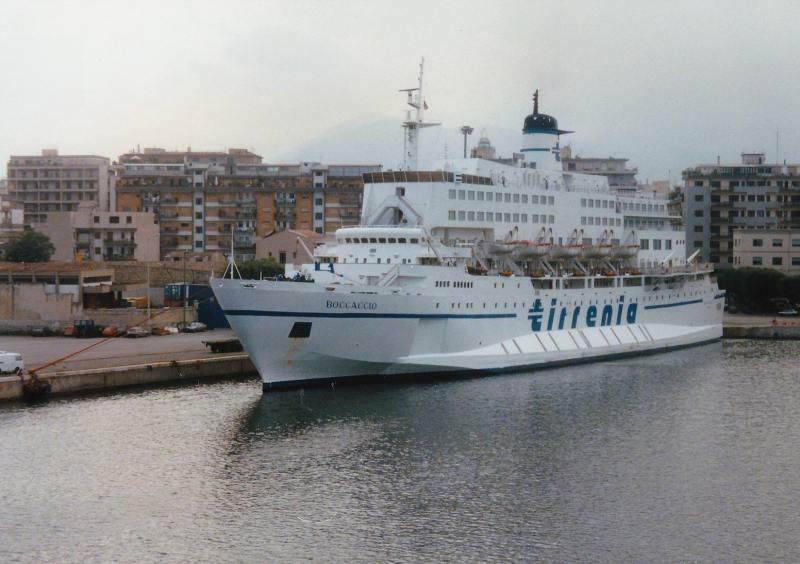 The Tirrenia ferry Boccaccio seen at the port of Palermo, Sicily, September 1997 (actual date not known). The ship, which was sold to El Salam Maritime in 1998 and renamed al-Salam Boccaccio 98, caught fire and sank in the Red Sea on 3rd February 2006. AL SALAAM BOCCACCIO 98 capsized due to the amount of water thaT was pumped aboard to tackle an engineroom fire. The pumps to remove that water were not working properly and many of the drains were blocked. It is quite erroneous of amateur naval architects and armchair marine accident investigators to suggest that the added decks made the ship top-heavy and caused her to roll over. Although the vessel might have looked unstable (as well as pig-ugly) the side sponsons added at the time of the 'jumboisation' in Italy would ensure that she was no less stable than before the conversion. This ship was sunk and so many lives were lost due to the stupidity of her crew and owners. REG, this is the ship that was lost in the Red Sea in 2006. See my notes in the photo details section. Wasn't there a ship, that looked a lot like like one, that capsized in the Red Sea a few years ago, with a great loss of life? I recall seeing a file photo of it in the news afterwards and thinking that it looked so unstable that I wasn't surprised to hear that she had gone over. Should have called them the "Beethoven Class" Bound to roll over! That just has to qualify for Ugly Ship of the Day? (Month/Year?) Time for a new category methinks! If I saw that in the port, I'd take another operator, no matter what it cost! I'd love to see this ship in storm carrying McDonalds-shaped passengers up there, lol. Totally agree with you, Mr.Dot and Kyle - the new top is hideous! Thought it worth uploading though for the record, having found a few old photos I took the 90s. Thanks for your comments. not only were these conversions rather hideous looking, but they were inherintly unstable, resulting in very heavy loss of life when resold to 3rd world operators! mrdot. This photo has been shown 2,978 times since it was added to the site.